Abstract: This study observed the relationship between the addition of folate onto Doxorubicin (Dox) loaded lipid micelle nanoparticles (LMN) and the death of MCF-7 breast cancer cells. The study used MCF-7 cells because they express folate receptors that allow folate to act as a targeting molecule when attached to the outside of the micelle. 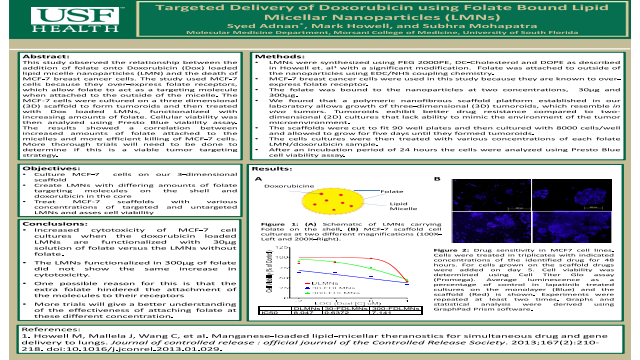 The MCF-7 cells were cultured on a three dimensional scaffold to form tumors and then treated with Dox loaded LMNs, functionalized with increasing amounts of folate and at different micro molar concentrations. The cell cultures were then incubated and viability was then analyzed by staining with Presto Blue and reading with a 560/590nm laser. The results showed a correlation between increased amounts of folate attached to the micelles and death of MCF-7 cells. The results suggest that the increased amount of folate attached to the nanoparticles is the cause of increased cell death. Though there are some observed results, more trials will give clearer results in the future. Summary: Doxorubicin was loaded onto lipid micelle nanoparticles which were functionalized with folate and then administered to 3 dimensional cultures of cells that express folate receptors. References: Howell M, Mallela J, Wang C, et al. Manganese-loaded lipid-micellar theranostics for simultaneous drug and gene delivery to lungs. Journal of controlled release : official journal of the Controlled Release Society. 2013;167(2):210-218. doi:10.1016/j.jconrel.2013.01.029. Marwa M. Essawy1,2, Sagy L. Assar1, Hend M. Abdel Hamid1, Sahar M. El-Sheikh1, Fatma H. El-Didi1, Zeinab E. Darwish1, Hanaa S. Raslan1, Ghada M. Mourad2,3, Marwa M. Afifi1.